Being the most common type of flower to display in the holiday season, Poinsettias alone can really help dress up any living space. With their different shades – from burgundy red and bright orange to soft pink and creamy white, they simply look stunning and can be displayed in an array of ways. Even simple arrangements make a huge holiday impact. Whether potted or arranged in vintage jars, white pitchers, clear tiny vases, and in silver pots for some sparkle, they create gorgeous centerpieces. Incorporate delicate ornaments and candles that complement the centerpiece and add extra visual interest. 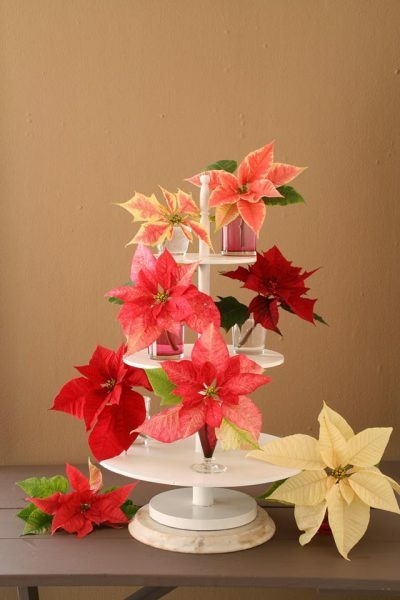 You can try to mix and match cut poinsettias in different colors and lend your holiday décor a fantastic look! 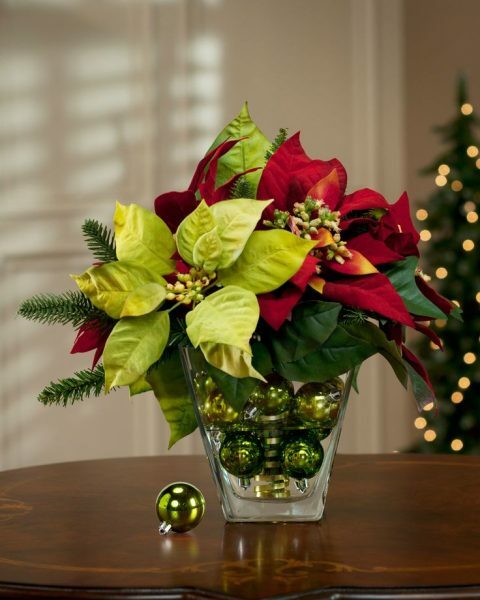 Definitely a holiday favorite, poinsettias are a must-have Christmas décor! 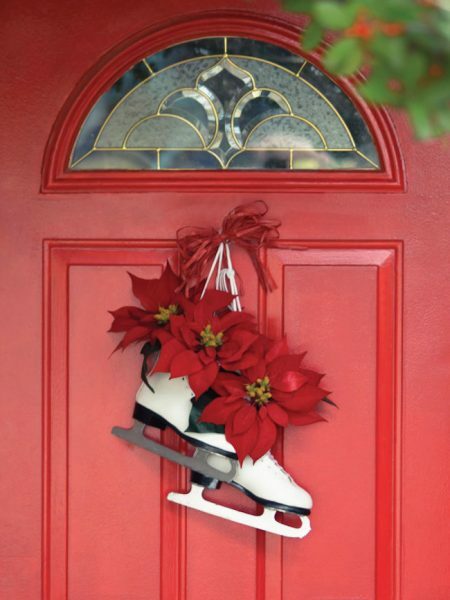 This arrangement of white skates and red poinsettias is absolutely stunning! Hanging on a truly unique red front door, it makes an eye-grabbing embellishment for the holiday season! Wreaths and poinsettias are widely used as front porch Christmas decorations. Definitely a gorgeous, creative way to welcome your guests! Get creative! 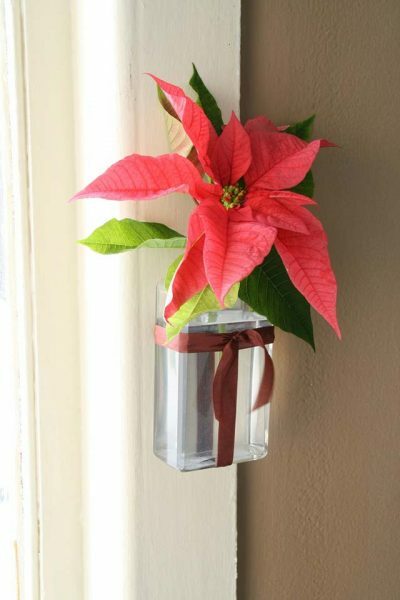 Poinsettias can be displayed in delicate clear glass vases or old wine bottles. As in the picture shown above, even simple glass or plastic containers and can do the job. A single red poinsettia positioned in a clear plastic container complemented by a piece of ribbon makes statement seasonal décor. Simple and affordable yet so elegant! What a beautiful way to add a holiday vibe, color, visual interest and appeal, charm, and personality to any living space for the holiday season! Look at this fascinating centerpiece! Multiple flowers of different colors placed in glasses of water and displayed on a tiered tray. Gorgeous, isn’t it? Definitely a fabulous piece of holiday décor! When it comes to centerpieces, you can simply place individual poinsettia flowers in small glasses of water and scatter them throughout the center of the table. Another eye-grabbing option is to combine Poinsettias and candlesticks for a truly beautiful, candlelit holiday dinner, such as the one shown above. This easy-to-make, simple yet stylish Christmas centerpiece can definitely lend a classic holiday look to your living space. 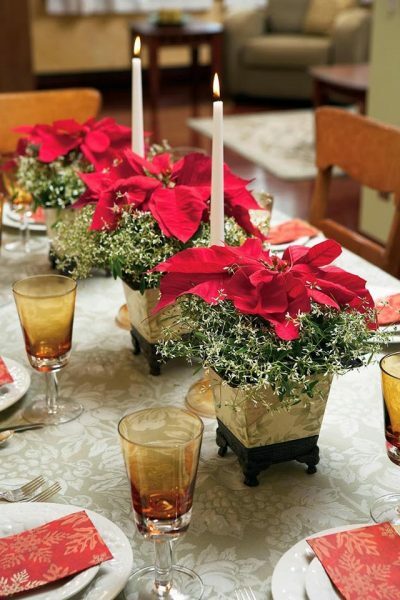 If you want to add to the rustic look of your Christmas table, try with a wooden flower box. 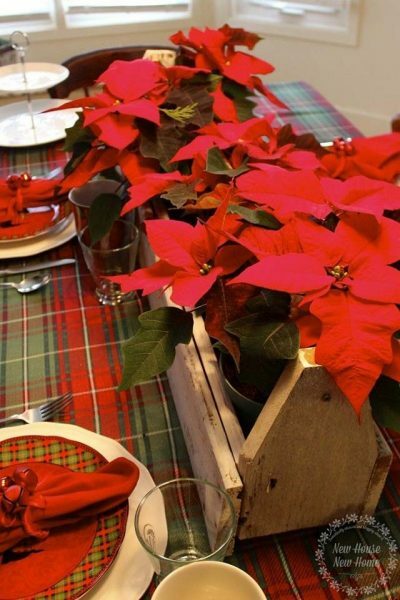 For this Christmas table setting, a grouping of poinsettias is tucked into a reclaimed wood box in the middle of the table. Fantastic display, don’t you think? 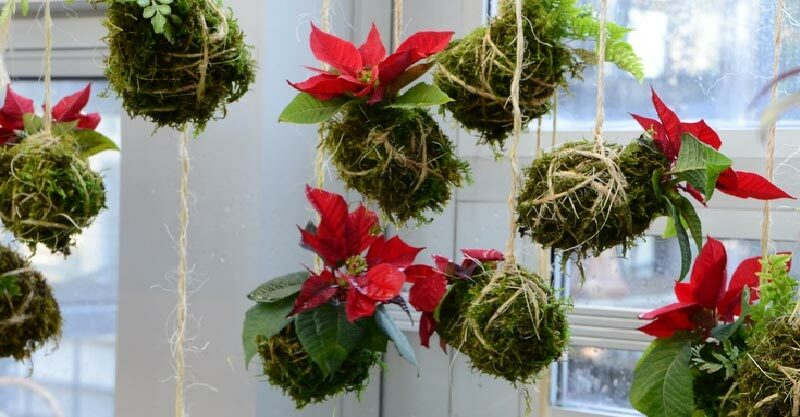 Want to try some DIY projects with Poinsettias, fake or real? What about the arrangement shown above? Glittering Christmas ball ornaments complement fake flowers. Lovely, isn’t it? However, if you want to stick to real flowers, use mason jars with water and add some red bells for extra charm. The fireplace is one of the main areas of the home that often gets decorated for the holidays. Get creative and incorporate some Poinsettias in the fireplace décor. Whether a rustic display box of Poinsettias on the mantel or wicker baskets next to the fireplace, the choice is yours, just stick to your favorite Christmas décor style. What’s the holiday season without some Poinsettias? You can’t really go wrong bringing these gorgeous flowers into your home throughout this magical time of year!